It’s hard to sell to people that you don’t know. Buyer Personas (2015) gives you the tools you need to truly understand your customers – their motivations, their quirks, their reservations – so that you can fine-tune your messaging to become a maximally effective seller. 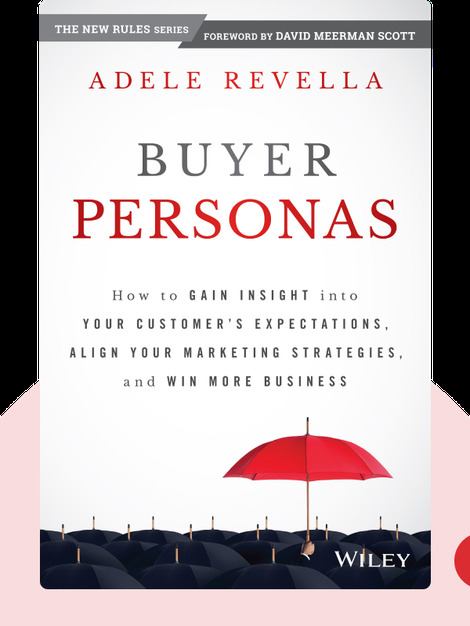 Adele Revella is the CEO and founder of Buyer Persona Institute, and a leading authority on buyer personas. In addition to running the Institute, she is also a marketing and business leadership speaker, consultant, blogger and workshop facilitator. [Adele Revella: Buyer Personas] copyright , John Wiley & Sons [Inc. or Ltd. as applicable] Used by permission of John Wiley & Sons [Inc. or Ltd. as applicable] and shall not be made available to any unauthorized third parties.